The etiology of primary NHL of bone is not currently known. Certain subtypes of NHL have been shown to be associated with a virus (Epstein-Barr virus [EBV], human immunodeficiency virus [HIV], human herpes virus-6 [HHV-6]). However, viral etiology has not been studied to any great extent in primary NHL of bone. 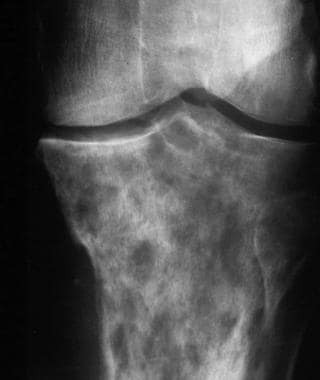 The following image depicts a radiograph with lytic lesions in an adult long bone. Radiologic studies will often show a moth eaten/permeative lytic pattern that can involve the entire bone. There is usually no internal matrix production with these tumors. Go to Malignant Lymphoma and Non-Hodgkin Lymphoma for complete information on these topics. Primary non-Hodgkin lymphoma (NHL) of bone can be a difficult to diagnosis without a high level of suspicion. The most common presenting symptom is pain without antecedent trauma that is unrelieved by rest. [2, 8, 9, 6, 7] This condition can present as monostotic or polystotic disease, [4, 5, 6, 7, 8, 9] most often in the long bones of adults, with the femur being the most common location. No specific radiologic findings are seen, and when detectable, primary NHL of bone can have a heterogeneous appearance with lytic, blastic, and mixed lesions reported (see the following image). [6, 7, 9] Additional imaging features include periosteal reaction, soft-tissue extension, pathologic fracture, and cord compression. The radiologic differential diagnosis includes benign entities (reactive conditions, osteomyelitis) and malignant entities (Hodgkin lymphoma, sarcoma, neuroblastoma, metastatic disease). Go to Malignant Lymphoma for complete information on this topic. 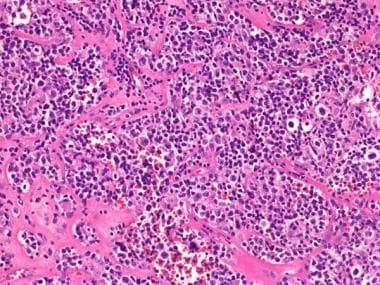 The histology of lymphoma is composed of atypical lymphocytes of varying sizes and is often associated with hyalinized extracellular matrix. 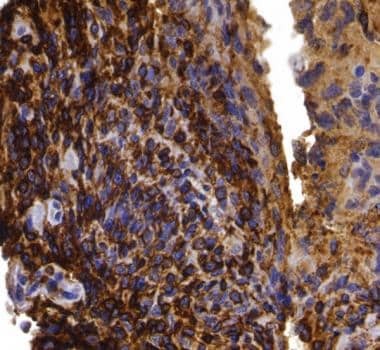 The atypical and heterogeneous cells can often give a clue to the diagnosis, but given the overlap with other tumors and even chronic infections, immunohistochemistry and other data should be used in diagnosis. No specific immunophenotype has been reported for primary non-Hodgkin lymphoma (NHL) of bone, and immunophenotypic findings will depend on the subtype of NHL present. The majority of the cases are of the diffuse large B-cell lymphoma (DLBCL) subtype, and can be divided into cases of a germinal-center phenotype (CD10+, BCL-6+, MUM-1-) or cases of a nongerminal center phenotype (CD10-, BCL-6-, MUM-1+) by immunophenotyping (immunohistochemistry alone or in combination with flow cytometry). Of the non-DLBCL cases, the majority are of a B-cell phenotype. [4, 5, 6, 7] Occasional cases will show a T-cell phenotype, a finding that is more commonly seen outside the Western world. See the following images. Primary lymphoma of bone is CD45RO positive, which characterizes these tumors as lymphoid in origin. 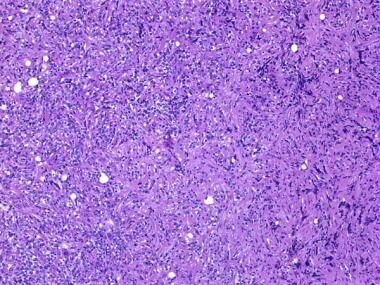 Most primary lymphomas of bone are B-cell in origin, as identified here with positive staining with CD20. The ability to perform a large-scale study of molecular findings in primary non-Hodgkin lymphoma (NHL) of bone is precluded both by the rarity of this entity and the effects of specimen decalcification (ie, nucleic acid degradation). 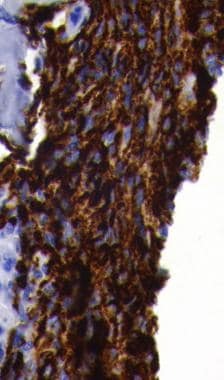 To date, molecular findings in primary NHL of bone have been reviewed on a limited basis and have shown disparate results. In an effort to clarify lymphoma staging, the International Prognostic Index (IPI) was designed to predict the risk of disease recurrence and overall survival, by taking into account factors such as age, stage of disease, performance status, number of extranodal sites, and the presence or absence of an elevated LDH. Power DG, McVey GP, Korpanty G, et al. Primary bone lymphoma: single institution case series. Ir J Med Sci. 2008 Sep. 177(3):247-51. [Medline]. Lima FP, Bousquet M, Gomez-Brouchet A, et al. Primary diffuse large B-cell lymphoma of bone displays preferential rearrangements of the c-MYC or BCL2 gene. Am J Clin Pathol. 2008 May. 129(5):723-6. [Medline]. Ramadan KM, Shenkier T, Sehn LH, Gascoyne RD, Connors JM. A clinicopathological retrospective study of 131 patients with primary bone lymphoma: a population-based study of successively treated cohorts from the British Columbia Cancer Agency. Ann Oncol. 2007 Jan. 18(1):129-35. [Medline]. Barbieri E, Cammelli S, Mauro F, et al. Primary non-Hodgkin's lymphoma of the bone: treatment and analysis of prognostic factors for Stage I and Stage II. Int J Radiat Oncol Biol Phys. 2004 Jul 1. 59(3):760-4. [Medline]. Stein ME, Kuten A, Gez E, et al. Primary lymphoma of bone--a retrospective study. Experience at the Northern Israel Oncology Center (1979-2000). Oncology. 2003. 64(4):322-7. [Medline]. Rappaport DC, Chamberlain DW, Shepherd FA, Hutcheon MA. Lymphoproliferative disorders after lung transplantation: imaging features. Radiology. 1998 Feb. 206(2):519-24. [Medline]. Hsieh PP, Tseng HH, Chang ST, Fu TY, Lu CL, Chuang SS. Primary non-Hodgkin's lymphoma of bone: a rare disorder with high frequency of T-cell phenotype in southern Taiwan. Leuk Lymphoma. 2006 Jan. 47(1):65-70. [Medline]. Glotzbecker MP, Kersun LS, Choi JK, Wills BP, Schaffer AA, Dormans JP. Primary non-Hodgkin's lymphoma of bone in children. J Bone Joint Surg Am. 2006 Mar. 88(3):583-94. [Medline]. Messina C, Ferreri AJ, Govi S, for the International Extranodal Lymphoma Study Group (I.E.L.S.G.). Clinical features, management and prognosis of multifocal primary bone lymphoma: a retrospective study of the international extranodal lymphoma study group (the IELSG 14 study). Br J Haematol. 2014 Mar. 164(6):834-40. [Medline]. Chisholm KM, Ohgami RS, Tan B, Hasserjian RP, Weinberg OK. Primary lymphoma of bone in the pediatric and young adult population. Hum Pathol. 2016 Aug 20 [Epub ahead of print]. [Medline].